Reduce mouse clicks needed to thread together multi-frame text flows. Is there a better alternative to TextStitch for InDesign? Is TextStitch for InDesign really the best app in Author Tools category? Will TextStitch for InDesign work good on macOS 10.13.4? Lightning Brain TextStitch for InDesign plug-in helps the user to highly reduce the number of mouse clicks needed to thread together multi-frame text flows. 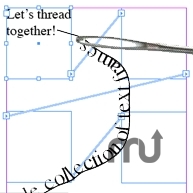 Two threading methods are provided: 'Quick Stitch' which allows threading of frames in user-defined order with just a single mouse click per text frame, and 'Auto-Stitch' which threads loose text frames in fully automated fashion. Now also allows text-on-a-path to be stitched along with normal text frames. InDesign CS, CS2, CS3, CS4 or CS5. TextStitch for InDesign needs a rating. Be the first to rate this app and get the discussion started!